Learn about the Biltmore House in Asheville, North Carolina by reading Biltmore House—Biggest Home in America by Charlie Spence, Travel Writer. It features a mini, but thorough tour of the destination, plus all you'll need to know to plan your trip including getting there, objective information on places to stay and eat, and things to do. At the end of the article, we've provided a summary of the contact information for your easy reference. Enjoy! Biltmore Estate, George W. Vanderbilt’s historic property in Asheville, NC. Some folks dream of castles in Spain, but in the late eighteen hundreds when entrepreneurs were flexing their muscles and showing what private business can do in a free society, leaders built their own castles in the United States. One of the most famous of these is in western North Carolina, still a family-owned estate where the fourth generation celebrates family and friends and welcomes visitors by keeping the Biltmore House and its magnificent gardens ever changing, ever surprising, and ever beautiful. George W. Vanderbilt loved this area of the Blue Ridge Mountains and visited it often for its natural beauty and for the opportunities to enjoy so many of the outdoor activities that this area offers, which you can now enjoy on your visit. In 1895, at the age of 26, his French chateau was finished and on Christmas Eve he began welcoming visitors. After more than a hundred years, it welcomes you. As you begin your tour through the building with 250 rooms, have on your good walking shoes. If you wish, the entire tour could take a full day. There are 34 bedrooms, 41 bathrooms, and 65 fireplaces. The basement alone could house a swimming pool, gymnasium with changing rooms, a bowling alley, servants’ quarters, and kitchen. Take your choice of either a self-guided tour or you might prefer a guide to take you to the interesting spots and discuss some of the unusual features. Throughout the tour you will see art and antiques. History buffs will find fascination in talking with tour hosts who are knowledgeable in the historic aspects of the property and the area. While the house itself is fascinating to tour, even more remarkable are all the treasures this structure contains. Here you will see thousands of original furnishings, including original art from such masters as Renoir. There are 16th century tapestries, more than 40 bronze statues, Napoleon’s chess set and thousands of volumes in the library. You will pass from room to room where you will find art, history and luxury. Vanderbilt considered this truly a family home. After a wedding in Paris in 1898, George and his bride came to live at the Biltmore where their only child was born and grew up. Even more in-depth looks at Vanderbilt and the mansion are available through specialty behind-the-scenes tours. Tickets and reservations are required to visit the Biltmore House. Behind-the-scenes tours require additional tickets. A tour of America’s largest home is but one adventure that awaits you at this Vanderbilt property. Originally that property consisted of 125,000 acres but over the years has been brought down to its present size of 8,000 acres. This shrinking has in no way diminished the features that have attracted visitors for more than a century. Here is a 1,000 acre back yard for beauty of gardens and a variety of activities. In season—April through October—you will find the gardens with breath-taking beauty. The walking trails provide opportunities to discover nature’s beauty at its finest. These gardens were designed by Frederick Law Olmsted, recognized as America’s foremost landscape architect. The rose garden alone features more than 250 varieties. Walk over to the formal Italian gardens and also check out the ancient trees in America’s first managed forests. There is more to this back yard than admiring the beauty of nature in a sculptured garden. Take a walking tour, peddle along a mountain biking trail, ride along a horseback trail, or see the area on a river float trip. Activities vary according to the seasons, but whenever you visit there are many opportunities to admire the Biltmore House and its surrounding natural beauty. One of those opportunities would be a visit to the Biltmore Winery. This is the most visited winery in the United States. A variety of grapes are grown on 94 acres at the estate and others are imported to annually produce 75,000 cases of about fifteen varieties of wines. Wine tasting is included in the admission to visit the estate. Here, wine experts will pour samples and discuss the merits of each variety and vintage. There is an outdoor dining area, which occasionally provides music. Visitors may purchase wines at discount prices. While at the winery, automobile buffs will want to see an auto George Vanderbilt purchased and which remains at the estate. It is a rare 1913 Stevens-Duryea Model C-six. Shoppers or lookers will find a Mecca of stores in Antler Hill Village. Here you may browse and select Appalachian crafts, dry goods, and old-fashioned candies. Drop into another shop where you will find products inspired by envisioning how Edith Vanderbilt would entertain her guests with table-top decorations. Select jewelry or pottery crafted by local artisans. At other shops you may select books, gifts, sophisticated apparel, and unique items for children. If you are interested in Biltmore’s agricultural heritage, go to the River Bend Farm. At this village you will see the River Bend Barn built in 1902 and restored in 2004 showing the rich farm life. There you will see displays of historic farm equipment and meet farm animals from chickens to draft horses. Activities at Biltmore vary by the season and there is always a variety of special activities to keep you fascinated by the life style of an early-American whose fortune was amassed through family interests in steamboats, railroads and other enterprises. Biltmore House is the largest home in America but not too big to welcome you and make you feel at home—and for a number of hours feel like an entrepreneur. Getting to the Biltmore Estate from almost anyplace is easy with Interstates and airports nearby. 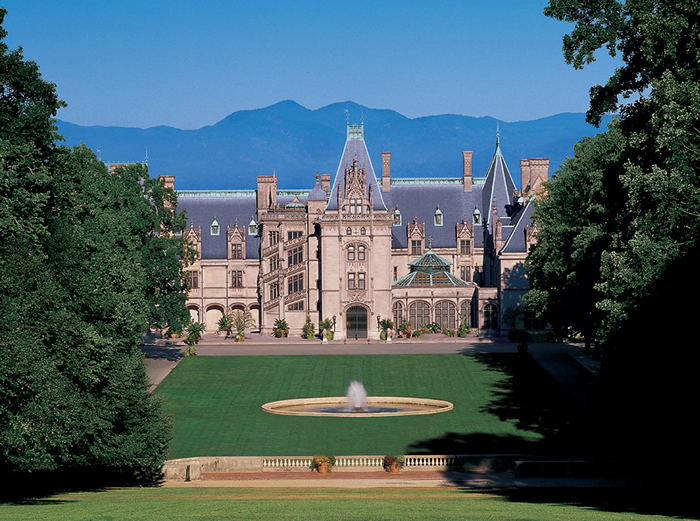 Enjoy an easy drive to Biltmore from most locations in the Southeast. Coming from the East on Interstate 40 take exit 50 onto Highway 25, turn left at the traffic light and follow signs. From Interstate 40 West, take exit 50B, stay in left lane and follow signs. From Interstate 26 East, in Asheville take I-240 east to I-40 West, exit 50B. From I-26 West, exit 31A, take I-40 East to exit 50. From Blue Ridge Parkway, take U.S. Highway 25 North exit to Biltmore about 4 miles. Air service is at the Asheville Regional Airport, served by commuter flights of several airlines having non-stop service to and from ten cities (as of March 2010) and connecting to service worldwide. Biltmore is located about 12 miles from the airport and rental cars are available. Greyhound Bus Lines serve Asheville. There is no rail passenger service available at Asheville. Inn on Biltmore Estate is a convenient and pampering lodging center with many amenities. There is a fitness center, outdoor pool and hot tub, high speed internet access, in room movies, concierge and 24-hour room service. Most Inn packages include Biltmore House admission tickets. A broad selection of other accommodations is available nearby. Facilities and prices vary from basic to luxury. Make your choice and reservations through WTA’s Online Travel Booking Service to get the best deal and the kind of facility that best suits your needs. Many eating places in Asheville serve from the “farm to table” concept, which is, preparing dishes mainly from locally-produced farms. This gives the area’s Southern cuisine a uniquely Asheville appeal. Some of the restaurants featuring this Southern menu are Early Girl Eatery, Harvest, and Red Rocker Inn. You will also find the usual fast-food shops and restaurants with the ethnic touch of French, German, Italian, Greek, Mexican, and Asian. Notice: This information is current as of June 2010. It is recommended that you contact the numbers, and/or visit the websites above to determine any changes to the information.